The Tier 4 Towtector is our flagship model - designed for both maximum protection and a clean, sleek look. A huge cut above all the other mudflaps on the market, the Tier 4 Towtectors protection gets MAXIMUM results. All this and the advantage of lightweight durable protection. 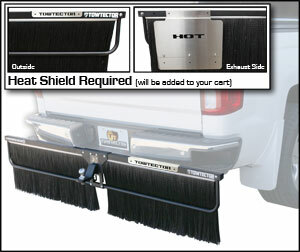 There is no doubt the Towtector brush strips protect whatever you’re towing better than a regular mud flap, stopping flying materials from bouncing, and forcing them to fall harmlessly to the road. So, what if we took a Tier 2 Towtector heavy duty brush strip and put a solid mud flap panel behind it? The Towtector brush strips prevent bouncing debris from hitting what you’re towing and disrupt the horizontal airflow of dust and water mist to reduce the “cloud” that can make lane changes so dangerous. At the same time, the solid mud flap stops anything that gets past the brush strip – a combination that brings you the best of both worlds! The aluminum wing design also adds the benefit of light weight, long lasting durability. Get great looking protection that is second to none. Get Towtector.